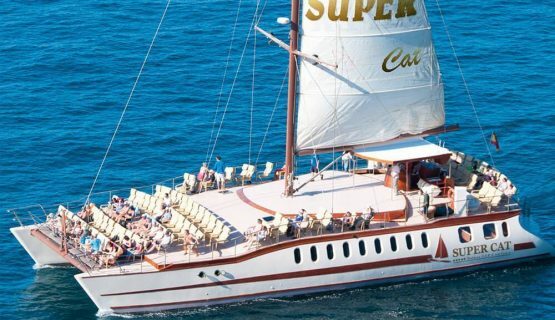 Join us on Europe´s Largest Catamaran, The Supercat. Allow our very experienced Captain and his crew take you on a wonderful trip off the coast of Gran Canaria in search of the most fascinating mammal of the sea, The Dolphin. 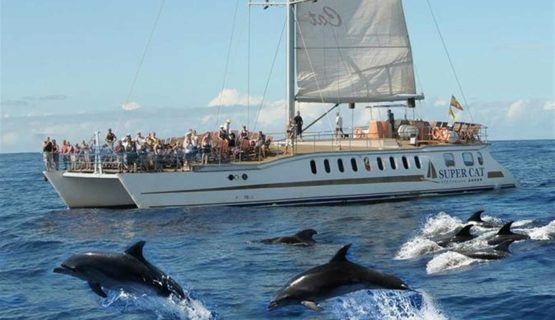 The Supercat Dolphin trips in Gran Canaria sail daily from 10am with various time slots throughout the day. The duration of the trip is 2.5 hrs. Hotel pick up is included from the main tourist resorts in Gran Canaria including Playa del ingles, Maspalomas, Puerto Rico, Amadores, San Agustin, Taurito, and Puerto Mogan. We board the Supercat Catamaran Boat on the harbour of Puerto Rico. The Supercat is purpose built for Dolphin Tours and sails with minimum disturbance to the sea life. The capacity of the boat is 240. To ensure that everyone is comfortable, we take a maximum 100 passengers on each trip. Many of you may have encountered Dolphins in an enclosed environment, for example, a rescue centre, Zoo or Waterpark Show. Whilst this is a great thing to see, nothing beats the experience of seeing Dolphins in their natural habitat, which of course is the Ocean. Often in the search for Dolphins, the Captain and his crew encounter other sea life, such as Whales and sea turtles, which makes the trip even more special. Book the Dolphin trip now and save €7 per person by booking here online. This amazing adventure cannot be missed. 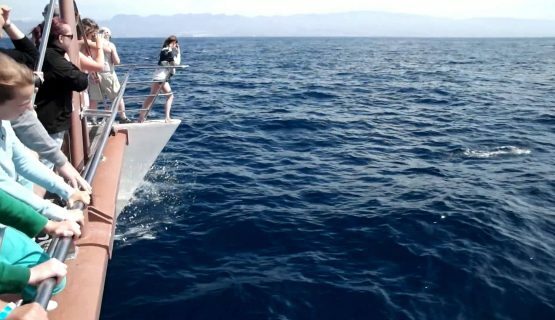 When visiting Gran Canaria, a Dolphin Trip is essential. The Canary Islands are one of the best places on Earth to see Dolphins in their natural habitat. On a rare occasion if we do not see Dolphins we will give you a return trip free of charge the following day. We board the Supercat Catamaran Boat on the harbour of Puerto Rico. The Supercat is a very impressive and purpose built for Dolphin Tours. It is 30 metres long and 12 metres wide and glides perfectly through the water with minimum disturbance to the sea life and maximun comfort for you. The capacity of the boat it 240 people. To ensure that everyone on board is comfortable with plenty of room, we take a maximum 100 passengers on each trip. The Canarian coasts attract very large amounts of plankton, due to its tides and this creates the perfect feeding ground for around 29 species of sea life. 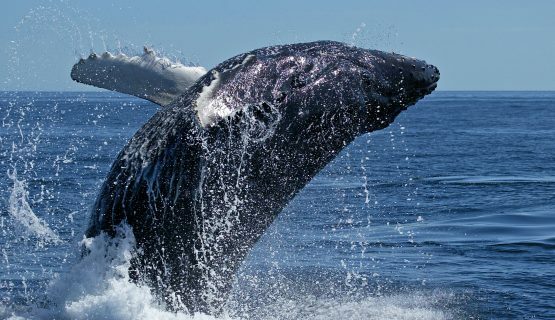 Orcas, Sperm Whale, Rough Whales, Beaked Whales and many more have been spotted only 12 miles from the coast. Often large Pods of Dolphins will follow the nose of the catamarán for part of your journey and this is a great chance to take some wonderful footage. Imagine seeing Dolphins playing together, jumping around into the air from the sea. It is so much better than in a swimming pool situation. 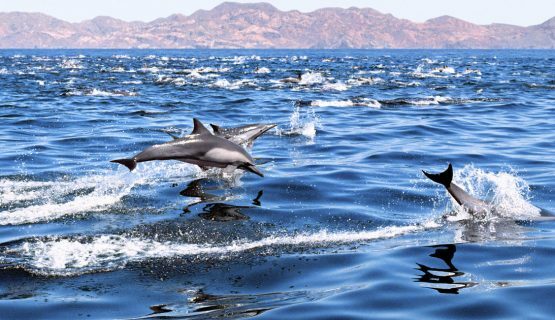 Spotted, Common and bottle nosed Dolphins are very playful and like to race through the ocean, along side the catamarán. As well as enjoying this amazing Dolphin search, we want you to enjoy the comfort of the boat. There are seats on the top deck for you to enjoy the sun as we cruise along. On the lower deck, there is a bar area and it is a good place to relax out of the sun. When we have finished our search for Dolphins, we head back to the harbour. Our Captain has over 20 years experience and knows the best spots to spot Dolphins. The success rate of spotting the Dolphins is over 90%. If you are unfortunate and the Dolphins are not spotted, you will be given another chance to return on the trip for free. We recommend suncream for the trip, as the cool breeze can sometimes deter you from how strong the sun is and sun hats for children. Suitable clothing and footwear (no heels) should be worn and remember your camera. What are the Days and Times of the Trip? The Supercat Catamaran Dolphin Trip sails every day, with various time slots available. Yes hotel pick up is included from the main tourist resorts in Gran Canaria including Playa del ingles, Maspalomas, Puerto Rico, Amadores, San Agustin, Taurito, and Puerto Mogan. Pick up times are from 09:00am - 09:45 depending on where you are staying all this will be confirmed in your booking confirmation email as soon as you have booked. Why should I book my Trip/Excursion with This is Gran Canaria? We work in conjunction with 90% of Hotels in Gran Canaria, so you can be assured that the Customer Service that we deliver is second to none. We have reps within all of the main resorts in the South of Gran Canaria and our helpline is open from 08:00-22:00, every day. The Deposit that you pay when you reserve your trip, is processed through Bookeo which is our secure SSL encrypted booking platform. How far in advance should I book my Trip/Excursion? We recommend that you book your Excursion as far in advance as possible, in order to guarantee your trip and day of choice. Some Excursions will fill up quicker than others, for example; Boat Trips, Jeep Safari and Buggy Tours, as they have a limited capacity. It also depends on the time of year that you are travelling to Gran Canaria, as some months are much busier than others. Do I pay for the Trip/Excursion in full? No. We reserve your place on the Trip with a small deposit. This will hold your place on your chosen excursion until you arrive in Gran Canaria. The remaining balance is to be paid on the day of the Trip. All payments are taken through Bookeo, , which is very secure and accepts Paypal, Stripe and all major Credit and Debit Cards. The remaining balance must always be paid in cash on the day of your excursion. We recommend that you book online, as it is a secure payment through Bookeo and you receive the benefits of the ‘Online Only’ Discounts. What if I am having problems booking my Trip/Excursion? If you are having problems, Email [email protected] or Call us on 0034 678 283 414 or Call or Whatsapp on our UK number +447473376534 and we will endeavour to find a solution for you. Can I book extra Trips/Excursions when I have arrived in Gran Canaria? Yes, we have reps based in most of the resorts in the South of Gran Canaria, between Bahia Feliz and Puerto De Mogan. If you see something you would like to do after your arrival, you can Call us on 0034 678 283 414, or Call or Whatsapp on our UK number +447473376534 and we can send a rep to make your booking. We do recommend advance bookings though, to avoid disappointment. Are there special rates available for group bookings? Yes, depending on Group size, the Excursion you wish to do and availability of the Trip, we can offer Group Discounts. Please email us the details of your group size, the excursion you want to do and your arrival and departure in Gran Canaria and we will find you a good deal! How do I know that my booking and Payment has been accepted? You should instantly receive an email confirmation, confirming your Excursion, Date and Time and Payment received etc (please also check spam folder, just in case). If you don’t see it within 15 minutes, please contact us and we will send it manually to you. How do I find out the details of the meeting point/hotel pick up for my Trip/Excursion? One of our reps will be in touch after we receive your booking to confirm all of these details for you. Many of the Excursions include return transfers from the hotel or sometimes a central meeting point in your resort. You can contact us with any queries you may have. Do I need to print my Trip/ Excursion ticket out and bring it with me? For some of the Excursions, it is sufficient to show the email confirmation on your phone. Where paper tickets are necessary, one of the This is Gran Canaria reps will deliver them to your hotel, upon your arrival in Gran Canaria. Do I need to bring my Passport or ID? For activities such as Quad Biking, Buggy Tours and Self Drive Jeep Tours, proof of age is required, as is a full driving license (card, not paper license) so please bring both documents for these Trips.